Although many diets recommend drastically reducing your carbohydrate intake to lose weight, you can enjoy carbohydrate-rich foods if you reduce your overall calorie content. However, choosing the right carbohydrates can accelerate your dieting efforts. 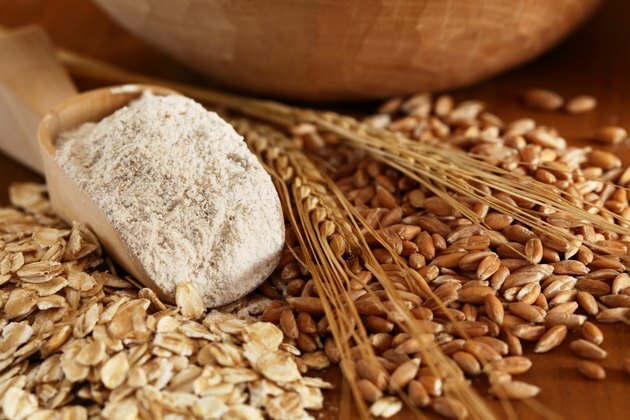 Due to the difference in calories, you may find whole wheat flour to be a better choice than spelt flour for dieting, but there are other nutritional values to consider. Check product labels, as nutrition facts may vary between brands. Spelt flour is higher in calories, with 113 in each 1/4 cup, compared to 100 in whole wheat flour. This makes whole wheat flour preferable for dieting, as the lower calorie content can help you achieve the calorie deficit required for weight loss. While 13 calories may not seem significant, many recipes call for more than this amount. If a recipe calls for two cups of flour, the spelt recipe would contain 96 more calories than the whole wheat recipe; it would take 26 minutes of weightlifting to make up that difference in calories. Spelt flour is slightly higher in fat than whole wheat flour, as the former contains 1 gram and the latter contains .5 grams per 1/4 cup. Both types of flour contain no saturated fat, a type of fat that may increase your risk of heart disease. Dietary fat is necessary for overall health, but it is high in calories, so you may wish to avoid fat-rich foods on diets. Most flours are rich in carbohydrates, and spelt and whole wheat flour are no exception. Spelt flour provides 22 grams of carbohydrates per 1/4 cup, while whole wheat flour contains 21 grams. Because of this, both are unlikely to be suitable for low-carbohydrate diets. If you want to bake on a low-carbohydrate diet, soy flour may be more appropriate, as 1/4 cup contains just 9 grams of carbohydrates. Fiber is a nutrient that provides feelings of fullness, so it can be beneficial for weight loss. Each 1/4 cup serving of spelt flour contains 4 grams of fiber, while 1/4 cup of whole wheat flour provides 3 grams of fiber. While this difference is not large, you may find spelt flour more filling in recipes that use more than 1/4 cup of flour. Whole wheat flour and spelt flour both contain 4 grams of protein. According to research from the May 2008 issue of "The American Journal of Clinical Nutrition," a high protein content can aid in weight loss, as it provides more satiety than other nutrients and your body burns significantly more calories digesting it. If you want a flour higher in protein, soy may be beneficial, as it contains 15 grams per 1/4 cup. Both spelt and whole wheat contain wheat gluten, a type of protein in wheat products. While most people can digest gluten, those with celiac disease cannot. Thus, both types of flour are inappropriate for gluten-free weight loss plans. What Are the Health Benefits of Rice Flour?